The team posing after their victory. Next stop, Houston! 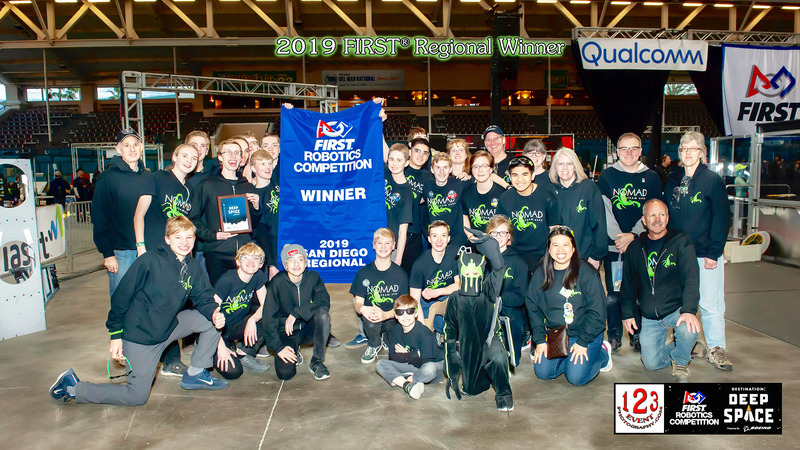 The Nomad team of young men and women based in Escondido just won the San Diego Regional Robotics Championships and are now heading to the world championships in Houston, Texas. The team was recognized at Wednesday’s city council meeting. During competition season, students have six weeks to design, build, and program a life-size robot to accomplish specific non-combative tasks. Competition is designed in such a way as to require students to work in cooperation with other competitor teams. Outside of competition season, students have the opportunity to train incoming students, refine their own skills, raise funds for the team, build a team brand, and engage the youth in the community in STEM (Science Technology Engineering and Math) activities. This year the team competed in the 2019 FRC San Diego regional. “Despite the illness of one of our drive team members, we ranked 18 out of 47 teams, and we were elated when we were picked to participate in the quarterfinals with the number one ranked team of the competition,” said Brady. FRC Team 6995 takes a bow at Wednesday’s city council meeting.